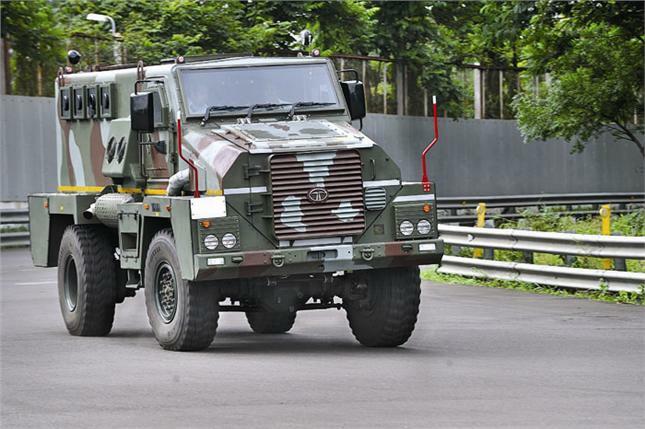 Though bereft of an appealing name, the 14 ton Mine Resistant Vehicle from Tata Motors’ defense subsidiary is as rugged as its Western peers. It’s also a recent addition to indigenous tactical light vehicles in South Asia (the MPV does stretch the definition of “light”), where demand for these systems is enormous. First unveiled in 2012, the MPV is a 10-foot-high 4×4 truck with a spacious interior. Capable of seating twelve passengers and two crew in its air conditioned confines, the MPV runs on a 240 horsepower turbo diesel engine encased in the hood behind a sideways opening steel grill. Its maximum road speed is a modest 80 km/h. The interior of the MPV. An interesting feature of the MPV is the engine can be removed from the cab via a pre-installed sliding carriage. All the maintenance crew needs to do is open the grill, open the hood, detach the engine from the gear box, and then pull it out. Despite not having the usual bells and whistles found on US-made MRAPs, the MPV weighs an impressive 28,000 lbs or 12.7 tons. Practical rather than cutting edge, its 12 windows, two roof hatches, and a turret hatch allow for visibility during patrols. Each of the four side windows have circular firing ports for small arms. The rear door also has a firing port. The placement of condenser fans on the left side of the MPV could expose it to blast damage, with untold consequences for the vehicle’s performance. To provide better illumination during night time, there are two roof spotlights that are manually controlled from within the vehicle. Being an MRAP, a V-shaped hull is integral to the chassis together with runflat tires. Owing to its height, the MPV can ford across bodies of water three feet deep. Without additional armor plating, the MPV is able to survive most anti-vehicle IEDs and mines that could destroy soft-skinned vehicles. Actual protection levels could be at STANAG III, or impervious to 7.62mm small arms and machine guns. It’s unknown how many MPV’s have entered service with either the Indian Army or the security forces, but a limited number are believed to be in police use. Being an Indian product, its export prospects are dim. This could ultimately benefit TATA, since any repair and after service work on an MPV is done at the local level.